Protective packaging has witnessed rising demand and popularity in recent years. This packaging protects the products from various kinds of damage by acting as a protective layer between the product and its immediate environment, and is used while transporting goods at various levels of the supply chain. It is used for both primary as well as secondary packaging. A steep rise in online shopping and e-commerce activities has given a major boost to the packaging materials industry as more and more goods now need to be transported. Innovations in protective packing solutions and investment in Research and Development are further propelling growth in the market. There is a rising inclination towards degradable, recyclable and environment friendly packaging materials globally. Molded pulp packaging is also regaining popularity, especially in the food and beverage industry. Appearance of the external packaging of products has also become important in recent years as it adds to the product’s appeal in the eyes of the customer. 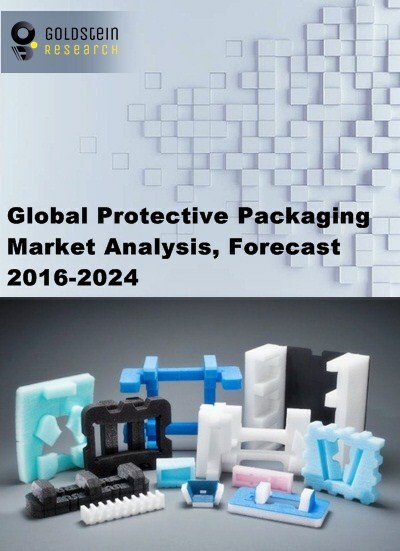 The global protective packaging market was valued at USD 21.9 billion 2016. It is expected to register a CAGR of 5% and reach a valuation of USD 32.4 billion by the end of the forecast period 2016-2024. Asia Pacific is expected to hold the largest share in the protective packaging market of over 35% during the forecast period, on the back of a booming e- commerce industry. Rising internet penetration and a rising middle class population, especially in China and India, are set to increase the size of online sales. Increase in industrialization and international trade will further bolster demand for protective packaging. Accelerating urbanization and shift in global economic power to these regions is another contributing factor. Europe and North America are also large and fast growing markets for protective packaging, after Asia Pacific. Regions with low penetration rates of e-commerce such as majority of Africa and Latin America will contribute insignificantly to the protective packaging market. Bubble and foam packaging are the most popular of all types of protective packaging and together account for more than 60% of revenue. By end use, the food and beverage industry attracts the widest application for protective packaging, owing to delicate and perishable nature of food items and intricate packaging requirements. Food delivery companies constitute a large portion of the demand for thermal/heat resistant packaging, while grocery retailers focus on spill proof, minimal or no damage packaging for their deliverables. Increasing popularity of online shopping worldwide, rising international trade and technological innovations in packaging techniques are the key factors driving the market for protective packaging. Demand is also increasing as businesses realize that the shipping package appearance is an important factor influencing the extent of customer satisfaction with the products. Regulations and compliance norms for packaging of various materials, especially food items and pharmaceutical drugs, pose as challenges for players in the protective packaging markets. The US FDA Guidance on Container Closures, Standard for restriction on excessive packaging of food and cosmetics, Product Quality and Standardization Laws in China are some of the laws acting as restraints. Rising environmental concerns are also posing threat to players using non degradable materials packaging materials.